Dental implants are a wonderful way to replace one, two, or an entire arch of missing teeth. If you are researching your options for completing your smile after tooth loss, you will find that nothing does the job better — but dental implants are the most expensive method of replacement as well. What influences the price of dental implants? A few things, from the surgical procedure to high-quality materials. But no matter the cost of dental implants in Burlington, this option is worth its weight in gold! Dental implant placement is a complex procedure that takes place over the course of several months. Your implant dentist will use state-of-the-art technology, tools, and methods to help you enjoy a successful and lasting tooth replacement. Given all that they require — visits to experts, surgery, anesthesia, and more — it’s not surprising that dental implants are more expensive than, say, a fixed bridge that can be finished in a couple of weeks. How many teeth are being replaced: Dental implants are individually priced, so this factor will have perhaps the greatest influence on the cost of the procedure. How healthy your jaw bone is: Patients who have had gum disease or who have been missing teeth for a while may require a bone graft or sinus lift before getting dental implants. This preliminary procedure increases the chance of implant success and also adds to the total cost of the treatment. Where in the jaw the implants are located: Due to aesthetic concerns, front teeth are typically more costly to replace than molars or premolars. What the dental implants are made of: Some patients with metal allergies or sensitivities may require/prefer an alternative option like zirconia or ceramic, which is more costly than titanium. Other considerations like anesthesia, sedation, etc. 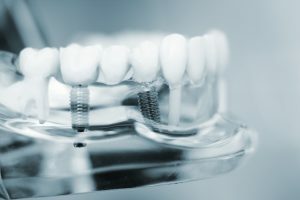 Once your implant dentist has provided an estimate for your implant procedure, you can begin discussing ways to make the procedure more affordable. Dental insurance does not typically cover the cost of the dental implants themselves, but portions of the treatment may be eligible for partial coverage. Even if you do not have dental insurance, you will likely qualify for convenient financing through a third party like CareCredit. This option can help you make smaller payments on the bill at a rate that suits you and your budget best. Whatever your dental implants cost, remember that there’s a good reason for their expense — and that there is no better investment than your lasting, beautiful, and healthy smile! Dr. James Kostas is a dental implant dentist offering high-quality, comprehensive care from the comfort of Complete Dental Care. He is dedicated to helping patients make the wisest decisions regarding their budgets and their oral health — and most of the time, that means dental implants for tooth replacement. To learn more about this option or to get an estimate for your procedure, you are invited to book a visit by calling (781) 272-0441. Comments Off on What Affects the Cost of Dental Implants?